“WHAT I AM doing is laying the facts before you as I know them,” Garda Commissioner Martin Callinan said towards the end of a five-hour hearing on the penalty points controversy at the Public Accounts Committee today. What became clear during the course of intensive questioning of Callinan, who was flanked by several other senior gardaí, was that his view on the cancellation of penalty points differs from the stance taken by two whistleblowers – or “so-called whistleblowers” as he referred to them – who could give evidence to the committee in the coming weeks. The two whistleblowers were revealed today to be serving garda sergeant Maurice McCabe and, as had previously been disclosed, a retired garda, John Wilson, both of whom have put forward allegations of widespread and systematic cancellation of penalty points. Though there have been the much-publicised issues with the fixed charge notice system, Callinan said these issues had been addressed and that he accepted the recommendations of the Comptroller and Auditor General’s (C&AG) report. The commissioner acknowledged that record-keeping had been poor in relation to the input of detail about some fixed charge notices through the Garda PULSE system but said, in relation to the whistleblowers, that when you “look at the totality of allegations…no thread of evidence has been found to date and nobody has come forward and provided that type of evidence” to back-up claims of widespread corruption in the system. The “so-called whistleblowers” came up at various stages during the committee. Callinan made the point that the captured evidence from the internal garda PULSE system took only a “snapshot” of the decision-making process in relation to terminations and said “they didn’t see the complete picture”. The Commissioner said the PAC’s intention to hear evidence from the whistleblowers was “extraordinarily unfair” and said he would be taking legal advice on the matter. But he went further as the hearings progressed, describing it as “quite disgusting” that two people out of a force of 13,000 people are making “extraordinary serious allegations” and there is not “a whisper” from elsewhere in the force of “corruption or malpractice”. Callinan acknowledged that one of those making the allegations is a serving member (Maurice McCabe) and did not rule out the possibility of disciplinary action being taken against him. He said in the context of the allegations, which he considers to be “unsubstantiated”, that the officers have made, the appearance of the whistleblowers would have an adverse effect on maintaining “discipline and order” and added it was his view that he “shouldn’t be usurped by subordinates”. Right at the end of the hearings Callinan also disclosed that the serving member, who he did not mention by name, has limited and supervised access to the PULSE system through “a prescribed mechanism”. “That’s the way it is unfortunately, that’s the way life is,” he added. Callinan extolled the virtues of the gardaí’s internal confidential reporting mechanism, but repeatedly refused to say how many times it has been used in its six years in operation, except for explaining it had been used in April 2012 for the disclosure of an allegation that a garda superintendent cancelled four fixed charge notices. This allegation, from the whistleblowers, was passed to an assistant commissioner but it wasn’t until eight months later that Callinan wrote to the whistleblowers. He then declined to reveal to Mary Lou McDonald what went on in that eight month period when the allegation was with the unnamed assistant commissioner as it was a “confidential process”. Both garda whistleblowers have indicated a willingness to appear before the committee, one of them as soon as next week, pending legal advice, but the PAC could decide to hear their evidence behind closed doors. “The case to hear from the whisteblowers is absolutely compelling,” Sinn Féin’s Mary Lou McDonald said. McCabe has indicated to TV3 News this evening that he would be prepared to come before the committee and give evidence in public session. 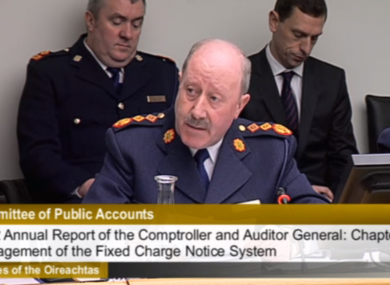 In his opening statement Callinan informed the PAC that an internal audit of the use of the fixed charge notice system carried out in November and December of last year found that “100 per cent of these cancellations were carried out within policy”. Fine Gael’s John Deasy asked if this is a new development, Callinan said it is not but that in recent months, as a result of a directive from his office, it is “much tighter controlled”. The C&AG report found the rate of terminated penalty points in the Ennis district was nearly 6 per cent, more than twice the average elsewhere, but Callinan said that it is “very, very difficult to put your finger on any one element” or reason for this. “I simply don’t know,” he told the PAC. “Summonses are a difficultly and have been a difficulty for us for many, many years,” Callinan told John Deasy who probed the increase in non-serving of court summonses for traffic offences. Deasy pointed out that a 2000 report by the C&AG made recommendation to increase cooperation with the Courts Service and said this was again highlighted in a 2012 report. The Commissioner insisted that the gardaí are “engaging with Courts Services on this issue” but admitted it is “a difficult area for us”. Labour TD Derek Nolan probed the issue of gardaí potentially cancelling penalty points for family members. Assistant Garda Commissioner John O’Mahoney’s report found that 99.5 per cent of over 1500 terminations that were examined had no identifiable family connection. Callinan said he expected that “each individual case would be examined on its merits and if there are merits for cancellation that that would take place”. Unsurprisingly he said he did not expect a garda to “get involved in doing favours for the friends or family”. In one bizarre exchange early-on in the hearings, Callinan detailed a case where penalty points were cancelled because “bees were worrying livestock”. He said that the person involved was a beekeeper engaged in voluntary work whose wife telephoned him to say his bees were “out of control”. He had to get back quickly as livestock and people were in close proximity, Callinan explained, saying that he had been speeding nine kilometres over the speed limit. The garda officer in question took the view that the offence merited cancellation, noting the person in question had no previous transgressions. Committee chairman John McGuinness also raised two particular cases where cancellation of points was questioned by the whistleblowers in their submissions to the PAC. This included where a person had their points cancelled as they planned to attend a court hearing, but the whistleblower found that that particular court was not sitting on the day in question. In another case, a garda had his points quashed after claiming he was on-duty when the whistleblower found that in fact he wasn’t in the area he would normally working and was on sick leave. This was part of a wider point by McGuinness who put it to Callinan that given the fact this information was “circulating around” would it not have been possible to bring in the two gardaí and have a “man-to-man discussion in relation to what they see as their duty to report what they see as wrongdoing”. Callinan told the PAC that in December 2012 he asked the two whistleblowers to hand back the material taken from PULSE and make a report through the confidential reporting mechanism. “They have chosen very carefully when to act and when not to act,” he later said. Email “'The facts as I know them': 11 things we learned from Martin Callinan's evidence to the PAC ”. Feedback on “'The facts as I know them': 11 things we learned from Martin Callinan's evidence to the PAC ”.